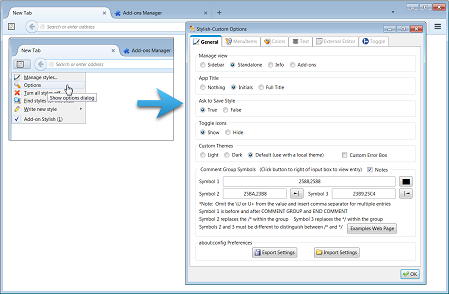 Many add-ons provide additional options and preference settings. There are a few ways to access them, but not a single standard way. How they are accessed depends on the way that the add-on's developer has created them. 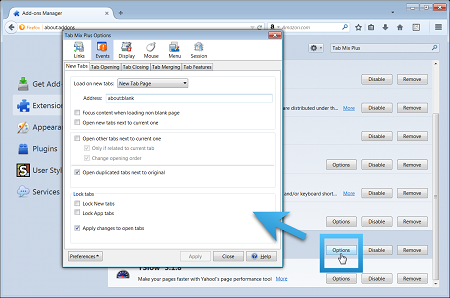 Assuming that additional options for an add-on are available, and after installing an add-on and restarting Firefox if necessary, follow these steps to access an add-on's options. Press Alt + t > a to open the Add-ons Manager. Click on Extensions in the side menu. Note: There is an "Add-ons" button available in the Firefox side menu that provides one click access to your add-ons. 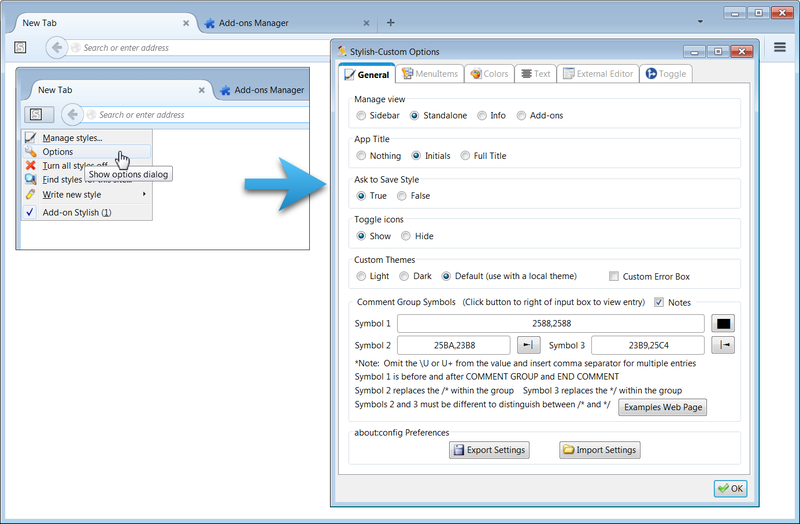 Some add-on's options are also accessible by right or left clicking on the add-on's toolbar button (if provided). The method(s) for accessing an add-on's options and/or preferences are dependent upon how the add-on's developer sets them to be. Many extensions have extra buttons available for you to place onto your toolbars or in the side menu. The following steps will show you how to access them. 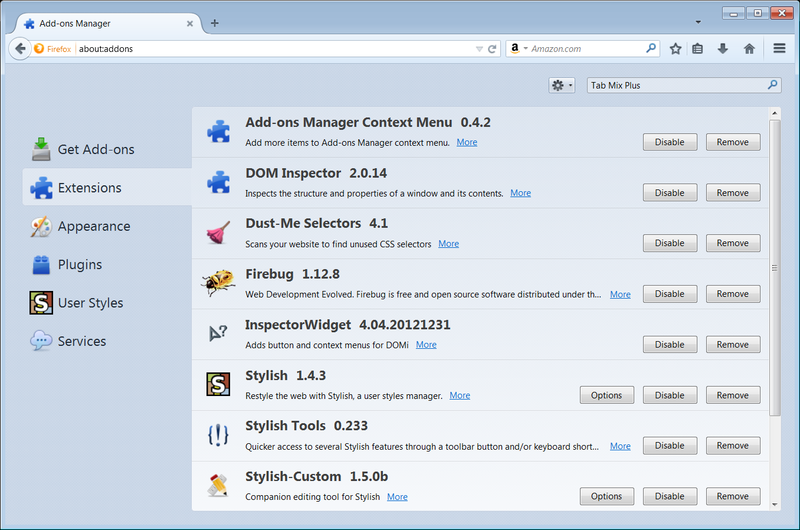 Click on the Firefox Menu button > Customize. Or, press Alt + v > t > c (View > Toolbars > Customize). Or, right click on any toolbar (with the exception of the Bookmarks toolbar) and select Customize. 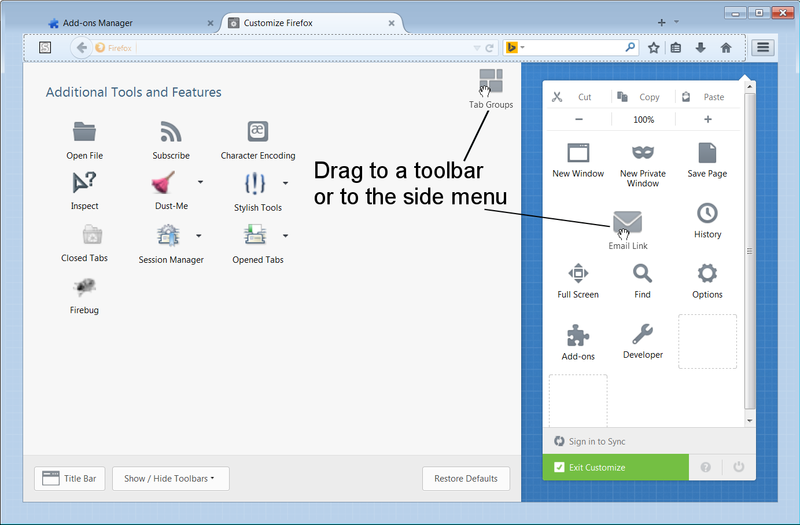 Drag the icon of the button that you want to add to a toolbar or the side menu and drop it. 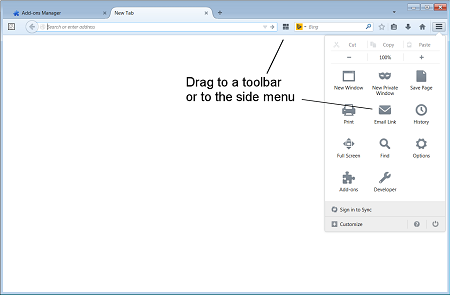 Furthermore, you can rearrange toolbar buttons, move them to different toolbars, and remove items from toolbars by dragging them onto the Customize Firefox tab. When finished, select Exit Customize or simply click on the menu button. 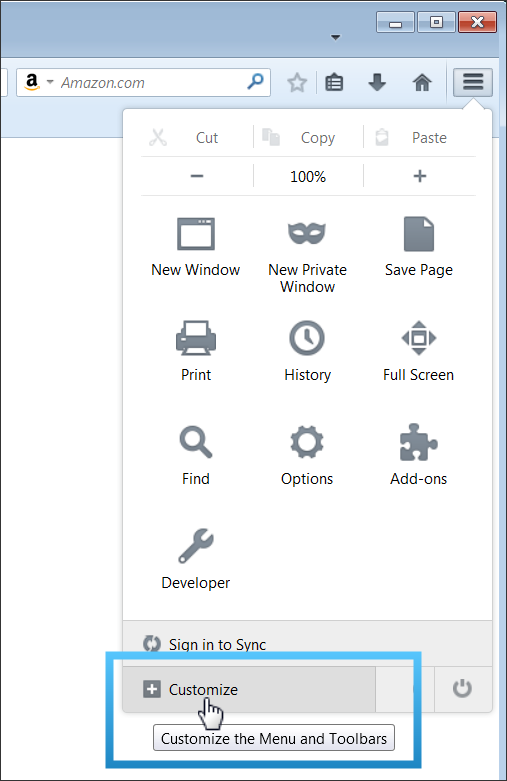 You can always reset all toolbars and toolbar buttons back to their original default state by selecting Restore Defaults in the Customize Firefox tab. Press Alt + v > t (View > Toolbars), and check/uncheck the toolbar's name. Or, Right click on a toolbar, check/uncheck the toolbar's name. 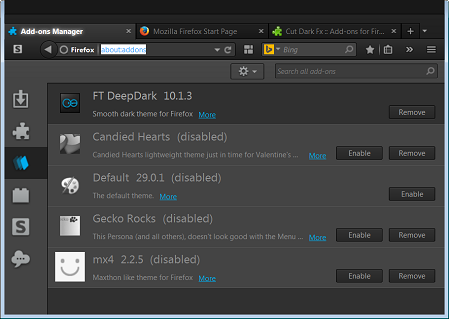 Or, click on Show / Hide Toolbars (bottom left) in the Customize Firefox tab. 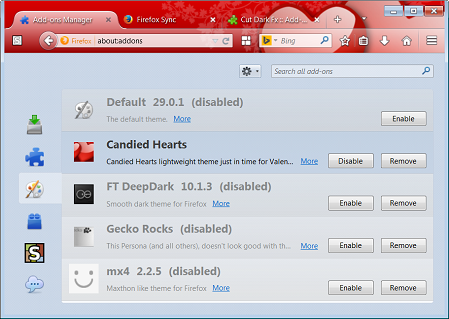 There are two types of themes available for Firefox. Complete Themes and Lightweight themes. 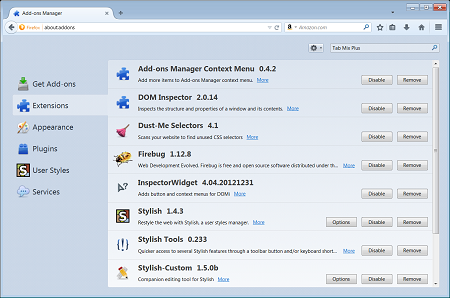 These types of themes apply styles to all of Firefox's interface including all buttons, windows, menus, toolbars, and so on. 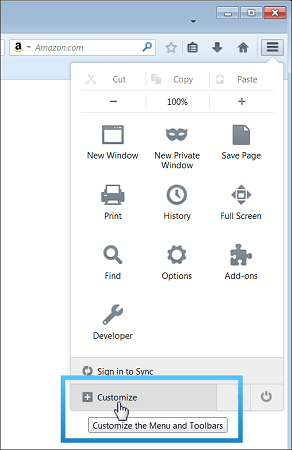 When you install a new Complete theme into Firefox, that theme will automatically be selected and displayed after you restart Firefox. If you have installed multiple themes, you will have to choose which one that you want set as your default theme. 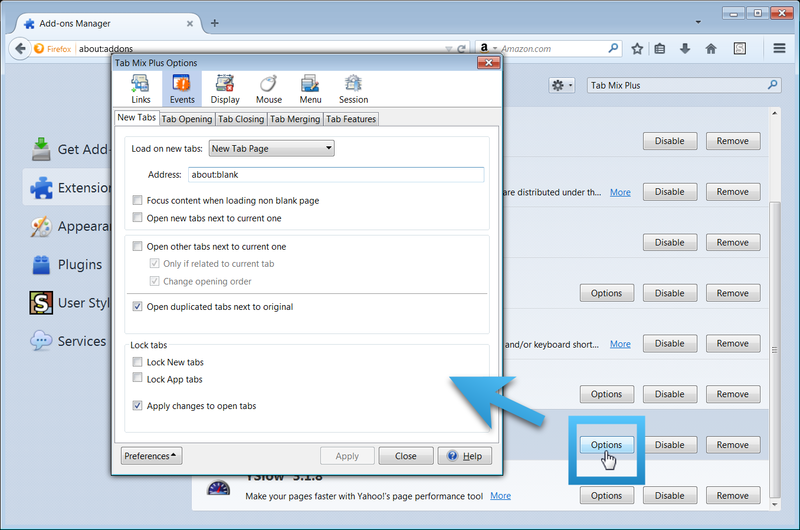 Press Alt + t > a (to open the Add-ons Manager), click on Appearance, highlight a theme (single click), click Enable, restart Firefox. These themes apply an image viewable through the top toolbars only (header). You do not need to restart Firefox after installing one, they are applied instantly.